Christina Martell was the Co-Producer and Festival Coordinator for the animated short film and viral hit Pigeon: Impossible written and directed in 2008 by her husband, Lucas Martell. She coordinated screenings in over 250 film festivals in 43 countries. 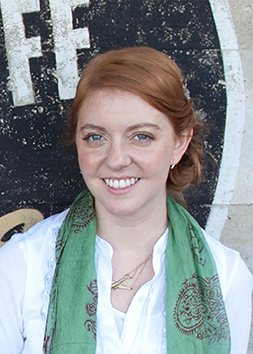 She has worked extensively with Austin film and fine arts organizations as a special events producer, fine arts museum educator, gallery curator, and development professional. While working with a variety of Austin’s private art galleries, she curated many of Austin’s contemporary artists, often in avant-garde exhibitions. Her focus centered on film and trans-media arts and she Co-Produced the 48Hour Film Project in 2011. From 2013-2014 she was the Post Producer for TBD Post, a turn-key edit/color/finishing studio. Christina Co-Produced The OceanMaker which has screened in 40 film festivals to date. She and Lucas will participate in a Q&A after it screens in the Big Dreams package. On Saturday, May 14, Christina will be a panelist on the Filmmaker Insights Panel 1: Looking for Laurels – Crafting a Festival Strategy. In addition to being the External Events Producer for Ballet Austin, Christina works as a freelance producer and Co-Produces with Lucas who owns and operates Mighty Coconut, a full-service VFX and animation studio in Austin, Texas. When not producing, Christina can be found chasing their toddler, Maryn Jolie, across parks and stranger’s front yards all over Austin, Texas.